Theresa May has said she "utterly condemns" the "barbaric" alleged chemical weapons attack in Syria.The PM said if the attack was confirmed as another example of President Bashar al-Assad's regime's brutality, "the regime and its backers including Russia, must be held to account".Russia has said no evidence of a chemical weapons attack in formerly rebel-held Douma has been found.The US and France threatened a "joint, strong response" to the alleged attack. "The UK utterly condemns the use of chemical weapons in any circumstances and we must urgently establish what happened on Saturday," Mrs May said after a meeting with the Danish Prime Minister Lars Lokke Rasmussen in Copenhagen. "If confirmed, this is yet another example of the Assad regime's brutality and brazen disregard for its own people and for its legal obligations not to use these weapons. "If they are found to be responsible, the regime and its backers - including Russia - must be held to account. "She said the UK was urgently working with its allies to assess what had taken place. "We've seen it's not only adults that have been affected, but children have been affected by this attack," she said. Medical sources say dozens were killed in Saturday's attack, but numbers are impossible to verify. 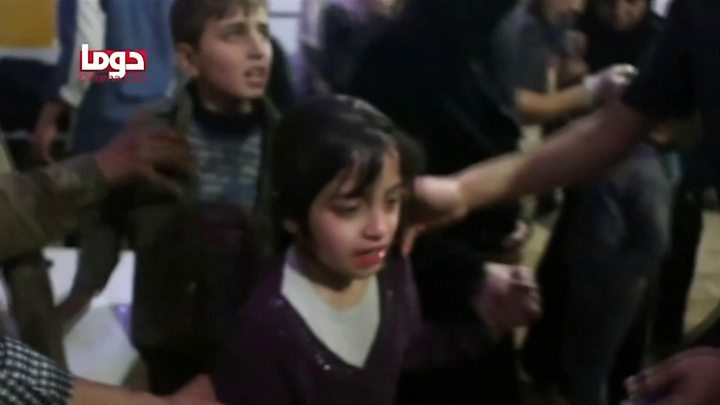 Videos shot by rescue workers showed lifeless bodies of men, women and children with foam at their mouths.Russian Foreign Minister Sergei Lavrov had said no evidence of a chemical weapons attack had been found, saying Russian specialists and aid workers had visited the area.The United Nations Security Council is discussing the allegations on Monday.Mrs May said the events in Douma fit into "a troubling wider pattern of acts of aggression and abuse of long-standing international norms on counter proliferation and the use of chemical weapons".She said Russia's "repeated vetoes" at the UN "have enabled these rules to be broken and removed mechanisms that allow us to investigate and hold to account chemical weapons attacks in Syria". "This must stop," she said. Tom Tugendhat, Tory chairman of the Commons Foreign Affairs Select Committee, told the BBC that the "UK should explore all options" and that is "absolutely right that we respond" to the attack in Syria.He said the evidence "points squarely to the Assad regime" and that the "UK government has the legal authority" to respond.Labour leader Jeremy Corbyn also condemned the use of chemical or biological weapons "in any scenario, anywhere in the world". "The tragedy and the terror of people's lives in Syria can only end by a political solution," he said. "That means every country in the region - every country in the region - as well as Russia and the United States coming together to ensure there is a meaningful ceasefire and there is a political process to bring about a political solution to the terror and tragedy and conflict that has wasted so many lives in Syria. "Shadow foreign secretary Emily Thornberry said: "What has happened in Douma clearly looks to be just the latest abhorrent attack in Syria using chemical weapons, a war crime for which the Assad regime has been found responsible in the past and which we utterly condemn." Comparing the attack in Douma to the "similar recklessness" seen last month with the poisoning of a former Russian spy and his daughter in Salisbury, the prime minister said that together with the international community, the UK would not tolerate Russia's "increasingly hostile behaviour". "The UK's case for holding Russia responsible for the attempted murder of Sergei and Yulia Skripal is clear," she said. "The government has concluded there's no plausible explanation other than that Russia was responsible. No other country has a combination of the capability, the intent and the motive to carry out such an act. "Russia has denied all involvement and their embassy said Sergei and Yulia "remain hidden from the public".In a statement at the weekend a Russian embassy spokesman said: "The stubborn refusal to cooperate, to provide transparency and to answer the numerous questions, means Britain has something to hide."